"David Moe and I are going up to visit Gary Snyder," he said, inviting me to come along. "Yeah, sure. Sounds like fun," I answered, eager to meet the author of Riprap, and translator of the Chinese poet Han Shan in a book called Cold Mountain. Kush had an intense way of communicating that came naturally. Everything was a holy experience—there was no letting go. You had to jump from one cloud to another or be damned to a prison of the ordinary. He never accepted the fact that America had not blasted off into Outer Space with prophetic engines running full throttle. "We can meet you at the Caffe Trieste over in North Beach. Say Saturday at about seven in the morning, when they open. It should take us about five hours. Gary lives on San Juan Ridge above Grass Valley." "You've made an appointment? Will he know we're coming?" By mid-morning of the appointed day we were on our way. I sat behind the wheel of my pale blue '57 Ford Fairlane with a bad muffler. By the time we passed Davis, a college town near Sacramento, I had dropped two tabs of Mister Natural acid, some of the best you could find anywhere. David Moe, a hulking figure with a wild imagination and a perpetual smile, who published Love Lights, a tabloid with images of enticing-looking women on the cover and nothing but street poetry on the inside, that sold in strategically placed newsstands throughout the Bay Area, sat next to me, laughing divinely. Neither he nor Kush took any drugs that day, so I flew on my own, happy to do so. I held to the road like a captain on a sailing ship, listening to the two of them go on about our meeting with Gary Snyder. We pulled off the road to eat at a roadside dive called "The Milk Farm.' Dazed and dazzled, I ordered a sandwich. Kush waxed on endlessly, portraying Snyder as a natural extension of the Sierra Nevada foothills where he lived. He built up the encounter, getting so excited that other diners turned to listen. Moe waved his arms in pure delight, adding his own words to the flow coming from Kush. I, on the other hand, dealt with my sandwich and my inner being, and with a sense that the trip to visit the great poet might not pan out. Massive thunderclouds embanked on the not so distant mountain peaks, coupled with the cold currents of air, should have been a warning. I thought about the Donner Party, those pioneers who dined on one another in a Sierra blizzard. This did wonders for the chemicals churning in my stomach and through my brain cells. We were going in the other direction than the pioneers, and we had a car, but who knows what can happen on a mountain road in mid-Winter? Fortunately, the LSD gods shrugged off such trivia. My car and I didn't look on a possible storm as a drawback. A dusting of snow never deterred poetic vision. So we get a little snow. It's just frozen water. Once my small party hopped back into the Ford, I dauntlessly sped on to the foothills past Sacramento, shoving aside the thought that we might need chains for our tires or heavier jackets than what we had with us. We had driven past several mini-towns when it began to rain. "No problem—it's just a little water," I assured my pals. A few service stations offered chains, rental and sales, but I drove on as Kush mumbled, "Look at those dumb signs for snow service." A light snow fell, merely a suggestion. I turned off the freeway onto a mountain road. Fewer and fewer signs of civilization presented themselves, although we were only in the foothills. We passed an apple orchard or two, a scattering of roadside businesses and isolated homes with chimney's belching smoke. The car purred, doing fine, even as we climbed dramatically. Pine trees lining the road threatened to swoop in and devour us, leaving not a trace. The snow fell more persistently as Kush announced that we might or might not have taken the wrong turnoff. We drove back a mile or so, not far, and then turned back again in the direction we had been going. "Uh, maybe we should return to Nevada City and think things over," I said through my acid haze. Kush demanded that we push on. He had the voice of the prophetic as he chanted, "Gary Snyder is a mountain . . . Gary Snyder is a mountain." This suggested an image to my messed-up head. "Snyder is Whitman is Bashō. . ."
My poet friend's words amused and irked me at one and the same time. In a way I was reassured that an entire lineage of poets had lined up to aid us in our quest. My fingers were nimble enough to keep the steering wheel steady, and I felt prepared to brake properly, if need be, so as not to go into a spin on the road, no matter its condition. Snyder appeared in my thought as being eighty feet tall, sitting at a giant sized writing desk. I nearly ran into this apparition, but my skillful driving saved us. Moe chatted as if the falling snow didn't matter. He began a verbal assault against the mounting nightfall—shadows grew somber as the snow took hold, not just on the pine trees, but on the route we traversed. No sooner did I turn onto one country lane then Kush asked that I go along another. We passed cabins buried in an avalanche of shadows and compounds where houses huddled like frightened deer. After a good hour of zigzagging in the wilderness, we pulled up at an aged cabin. We left the car, none of us with proper covering, and went to the door. I knocked loudly. Within moments a young, bearded man answered. "Come on inside," he said. "You guys must be cold." Kush mumbled wisdom from William Blake, David chuckled at his friend's delivery, and I walked in quietly, relieved to be in a warm room. A wood stove burned heartily. Next to it sat an old man in an advanced stage of Parkinson's. In another chair, almost a throne it was so huge and ornate, sat a perfect gentleman, with a probing gaze and a benign smile. He acknowledged our presence with a wave of one hand. Moe came up to him and made a kind of half bow as Kush warmed himself at the stove. I turned to the man who had let us in to tell him that we had lost our way, and were looking for the home of the poet Gary Snyder. He listened, while going into the kitchen to bring us coffee, which was already prepared as if he had expected us. Moe gave the man a copy of his magazine and even read from one of his longer poems, a surrealistic pastiche of imagery that drew all of us in to the haunting rhythms. When he stopped reciting he tottered and almost knocked over his coffee cup, but somehow managed to hold it steady. When we were together in the living room, the old man who resembled a Buddha, asked, "Have you come prepared for the mountain?" "Do you know it well?" I asked. He pointed to a window off to one side. Kush, Moe and I followed his finger as it reached toward the darkness. "Can you see there?" he said. "Ninety years ago to the day I was born in a log cabin that used to be there. I know the mountain. I know it well." He asked the same question again. "I'm worried," I said. "We don't have chains." As for my intelligence regarding Snyder, our host advised us that he worked closely with the poet, and that Gary was not expected back for a few weeks. "He's traveling," we were told. I turned to Kush with an expression of admonishment. He said, "Oh, well I guess we'll come back another time." The LSD started thundering through me as he spoke. I turned to the Buddha man, who now appeared positively ancient. His smile grew so wide that I believed I could climb inside of it to discover the world, even the universe, much as Arjuna did when Lord Krishna opened his yawp in The Bhagavad-Gita, and saw Moe out of the corner of my eye, hopping on one leg with his four sets of colored beads dangling about. Old Buddha man warned, "We don't have a place for you. There's not much time left if you don't have chains on the wheels of your car. So, you'd better finish the coffee and be going. You can come see Gary another time. Jim, the younger one, agreed: "Gary will welcome you, I'm sure." With that, we were soon off, but not before Kush gave a blessing, something like "Gary Snyder wrote a mountain, and we were on it. Gary Snyder sang the mountain as we drove down." In retrospect, those might have been my words. On the descent I gripped the steering wheel. My eyes were glued to the road. Snow stuck to the window, piling up really fast. I tried to go slow, but the acid pushed me into a feeling of invulnerability. For a time the wiper blades were good enough. After a while the frost thickened and I had to slow down. As the snow fell harder, and the road almost disappeared, I prayed to whatever gods were willing to listen. Kush and David remained positively serene. The car went into a slide, not much of one, but just enough to put me into a state of near panic. But an acid-inspired clarity fell over me as it often did when I drove. "The woods are lovely, dark and deep," I muttered from Robert Frost's "Stopping by Woods on a Snowy Evening." The words helped, especially the concluding lines, "And miles to go before I sleep." We turned onto a road that looked like a stretch across the Russian Steppes in mid-winter. Kush said, "Every snowflake has its own particular shape. There are millions of them, even billions; no two are alike." This made me laugh. "Think of the flakes that the tires are destroying," I said. "Trillions of graceful forms." I moved ahead cautiously with fog on the window obscuring my view. A chill entered my bones, and I almost lost control. Kush rescued me with a reading from William Blake. We were soon on the main highway, safely below the snow line: a clear route ahead. I never did return to San Juan Ridge, but I ran into the younger man from the cabin at the Caffe Trieste one afternoon. He said, "You were so sane on that stormy night, but your friends were really out of it. What were they on?" I could have said "poetry," but, instead, I bought him an extra-large cappuccino. It wasn't much later that Gary Snyder gave a reading in town. Kush and I arrived late. We sat in a far back row. But I was able to catch the crags in the Beat poet's face and wistfully think of the missed opportunity up on the high ridge where he lived and worked. I half expected him to read about the old Buddha man in the cabin, but he didn't. Kush forced his way toward the stage after the reading, but I wandered into the night, content to leave Snyder on his mountain. San Francisco poet and biographer Neeli Cherkovski is the author of Whitman's Wild Children, a collection of essays about twelve poets he has known. His brand new collection of poems is From the Middle Woods; his previous poetry collections include From the Canyon Outward, Leaning Against Time, Elegy for Bob Kaufman, and Animal. 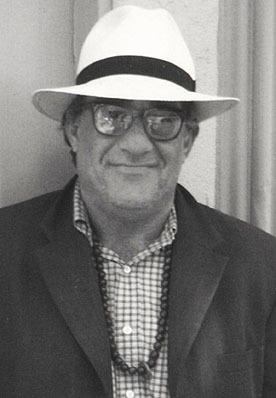 He has written biographies of Lawrence Ferlinghetti, Bob Kaufman, and Charles Bukowski. Photo of Neeli Cherkovski by Mark Gould.